The other day I was sitting with a friend of mine discussing the possibility of doing a horror movie together in Hungary. And he says, "Come on, man, horror is for guys with no options. It's a cop out." So, of course, my answer was, "Dude! James Bond and Harry Potter are doing it! Horror is legit now!" In deed it is. 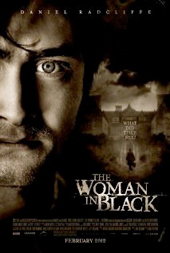 It must be no coincidence that Mr. Radcliffe picked a movie about an evil person from the past come back to haunt children...sounds familiar? All jokes aside, this was a thoroughly enjoyable film. Daniel Radcliffe's acting was quite professional. The script clearly doesn't allow him, or anyone else, to push any dramatic skills too far. But here Mr. Radcliffe executes pace and delivery superbly. A role obviously written for him, this is clearly an actor with a long career ahead and no shortage in skill. The rest of the cast was rounded up with surgical precision. Not a single character out of place. You could certainly put a play together out of this entourage. I enjoyed being reminded of the simple pleasure of actors turning average dialogue into believable fantasy. The story was well crafted. I found myself wanting to discover what was going on and trying to put the pieces together on my own. Which you can actually do if you pay attention. Something that I consider a sign of brilliant story telling. Allow your audience to be involved with you. The cinematography was picture perfect. You can pause the movie almost anywhere and you will find an exhibition-worthy snapshot. As far as the soundtrack goes, this film did something that should be enforced more often in filmmaking: less is more. The music is another character that goes in and out of scene, not something to inundate very frame with. Take note from this very well executed sound track. Turn the lights out and warm up a hot chocolate. But do grab that mug tight, as this movie will make you jump more than once. Enjoy.